Consumerism culture is modern and global and it speaks to a pedestrian interest in the streamlining of fashion and couture for shoppers interested in convenience and access (e.g., Amazon.com, Facebook, eTrade, Wal-Mart, etc.). So understanding how consumerism/capitalism might give rise to 'culture-exposure' through simple merchandising informs our evaluation of marketing-based networking (i.e., Wall Street). Investigating this 'dominion' from a philosophical, political, or even legal standpoint can help us analyze the modern intelligible value of the international currency market (a 'thesaurus' for capitalism dogma if you will) among other things! CONSUMER: I want to feel like I'm Irish! CONSUMER: This is more expensive than I thought. MERCHANT: Good taste is worth the cost. MERCHANT: It's all about aesthetics, no? CONSUMER: I suppose Chinatown is aesthetics. MERCHANT: Drink Baileys and you'll want to see Ireland. CONSUMER: It's great I can purchase this in America! MERCHANT: You can purchase Baileys online too. CONSUMER: What will they think of next? CONSUMER: You sound like the Devil. MERCHANT: I'm merely a 'leprechaun' (a critic)! Lucky Charms is a brand of cereal produced by the General Mills food company since 1964. The cereal consists of toasted oat pieces and multi-colored marshmallow shapes ("marbits" or marshmallow bits). The label features a leprechaun mascot, Lucky, animated in commercials (source of information: Wikipedia). Capitalism is a form of resource aesthetics negotiation (e.g., NASDAQ), so we can see how/why a culture-centric brand such as Lucky Charms (obviously an allusion to the Irish leprechaun) would be considered some kind of homage or toast to the general 'creativity' of consumerism itself. You might be served a bowl of Lucky Charms breakfast cereal by your hospitable stewardess on a KLM flight from Amsterdam to New York, which would motivate you to ask, "How do commercial contracts in the modern geopolitical landscape arise and how do these contracts complement tourism-gauged culture-exchange?" Commerce offers us appreciation of goods and services, but it also creates social networking and hence culture-exchange (e.g., World Bank). We should therefore contemplate how/why Lucky Charms breakfast cereal inspires in modern thinkers a contemplation of the contouring of culture-exposure with commercial ideology. 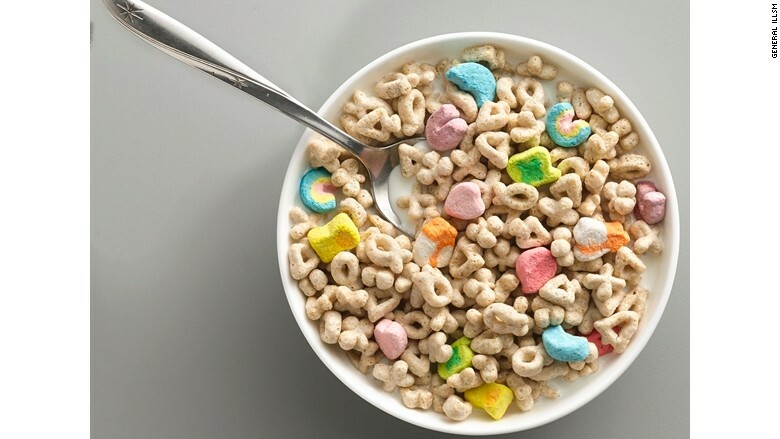 TRUMP: They should serve Lucky Charms in hotel continental breakfasts. TRUMP: The Irish leprechaun (Lucky) mascot represents hospitality! CARTER: Yes, commerce creates culture-exchange on many levels. TRUMP: That is the 'spirit/ethos' behind the hospitality of Las Vegas. TRUMP: Yes, they do, and checks-and-balances ensure improvements. CARTER: That's unfortunate, since ethnic-mascots symbolize teamwork! TRUMP: They sure do (e.g., sports-teams mascots), but it's a problem. TRUMP: That's what happened during the 2018 Winter Olympics. CARTER: Yes, North and South Korea were temporarily 'united' for media. TRUMP: Yes, we can consider why commerce-pacts destroy rebellions.